The movie is about a guy who failed (relative to his potential) for a decent portion of his life and somehow managed to turn it all around. 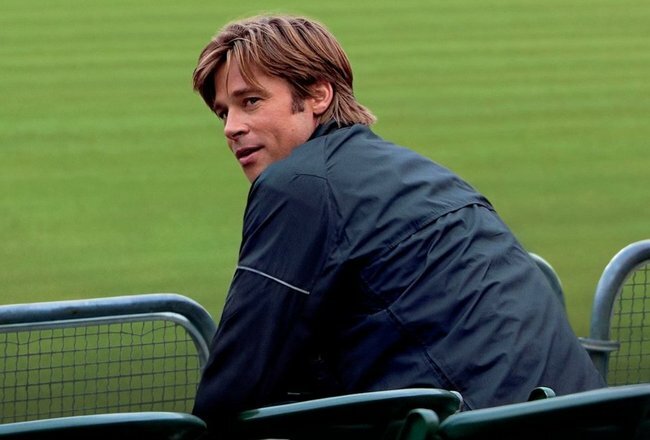 In that way, Moneyball reminded me of "Jerry McGuire" in that you have a big-name actor like Brad Pitt playing someone who is essentially a loser pretty convincingly, which is entertaining in and of itself. Billy Beane was considered by many to be one the most promising players to baseball when he was recruited out of high school in the 80s. But in his professional career he languished and never lived up to the hype. Adding insult to injury, he had turned down a scholarship to Stanford for a big paycheck. Then, right there on center stage, Beane failed for nearly 10 years before retiring from pro baseball to become a GM. And even as a GM for the Oakland As, victory eluded him. That is, until he hooked up with Jonah Hill's (fictional) character and started employing sabermetric principles which value players based on a complex mathematical formula rather than for their stadium appeal and good looks. This movie was re-written by Aaron "The Social Network" Sorkin, and it has the same feel as the Facebook film. You will definitely leave the theater inspired. I may even check it out again this weekend. Thumbs way up.